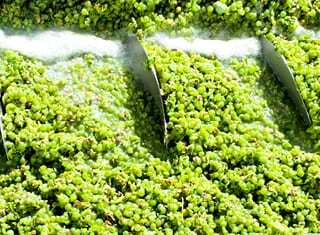 YAN surveys carried out in different regions of the world have frequently reported that a large percentage of the sampled musts are nitrogen-deficient and thus, YAN is the grape-must factor most often suspected as the cause for problematic fermentations. Therefore, this study aimed to gain insight into the general nitrogen status for the local wine industry. YAN can be defined as the nitrogenous compounds found in grape juice that can be taken up by the yeast and used as a source of nitrogen. YAN is very important for the growth and maintenance of the yeast cell and is primarily composed of ammonia (inorganic source of nitrogen) and amino acids (organic source of nitrogen). The amino acid portion is also commonly referred to as free amino nitrogen or FAN. Although grape juice contains many different sources of nitrogen, ammonia and amino acids are the sources that are most effectively taken up by yeast. Researchers have frequently reported that musts containing less than 140 mg/ℓ of YAN are nitrogen-deficient and will most likely not be able to support the growth of sufficient yeast populations required to successfully complete fermentation. As such, YAN is frequently associated with stuck or sluggish fermentations. Due to the pivotal role that YAN plays during fermentation, a survey of grape musts from the Western Cape was performed for two seasons (Figure 1 and 2). In 2016, the survey included samples from white cultivars only, while 2017 included samples from both white and red. The districts were identified according to the Sawis Wine of Origin classification. FIGURE 1. Number of samples per district above and below the recommended level of 140 mg N/ℓ of YAN for 2016 and 2017. Districts with less than five samples were excluded. FIGURE 2. Number of samples per cultivar above and below the recommended level of 140 mg N/ℓ of YAN for 2016 and 2017. Cultivars with less than five samples were excluded. Less nitrogen-deficiency was observed during 2016 as only 10% of the samples were found to be below the recommended level of 140 mg N/ℓ, whereas in 2017, a third (33%) of the total samples were classified as nitrogen-deficient. The inclusion of reds during the 2017 harvest has caused an increase in the percentage of samples found to be nitrogen-deficient, as red cultivars had a much lower average YAN (158 mg N/ℓ) compared to white (193 mg N/ℓ). When considering only the white cultivars for the two seasons, 18.3% of the samples were deficient in 2017 compared to the 10% from 2016. Furthermore, the average YAN for 2016 was 206 mg N/ℓ, similar to the average YAN of the white cultivars surveyed in 2017 (193 mg N/ℓ). This impact of the red cultivars on the average YAN also reflected in the number of wineries that had nitrogen-deficient musts. 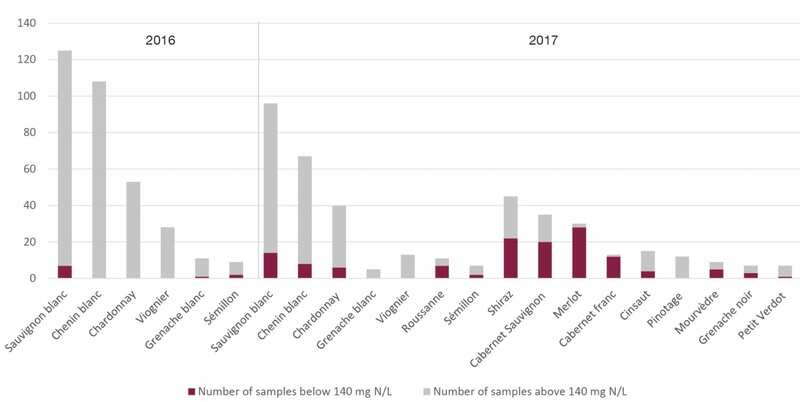 In 2016, only 50% of wineries were found to be faced with nitrogen-deficiency, whereas all wineries surveyed during 2017 had at least one sample below the 140 mg N/ℓ mark. It is therefore safe to say that low YAN is a problem that many wineries in our local industry face. However, it should be noted that, although less wineries were surveyed during 2017, these wineries were chosen on the basis that they received grapes from a wide range of districts and cultivars, increasing the chances of obtaining a pool of samples that are representative of the nitrogen status across the Western Cape. In both years, the maximum YAN concentration was found to be well over 400 mg N/ℓ; in 2016, the maximum YAN was found to be a Viognier sample from the Paarl district (438 mg n/ℓ) and in 2017, a Pinotage sample from the Swartland (484 mg N/ℓ). In this survey, Viognier seems to be a “very high YAN-yielding cultivar” as it was found to have a very high average YAN in both vintages (2016: 259 mg N/ℓ, 28 samples; 2017: 231 mg N/ℓ,13 samples), only surpassed by Pinotage (348 mg N/ℓ, 12 samples) in 2017. Furthermore, neither vintages surveyed had Viognier samples that could be classified as nitrogen-deficient. Of the more represented cultivars, Chardonnay (2016: 53 samples, 2017: 40 samples) had the highest average YAN in both years (2016: 235 mg N/ℓ, 2017: 208 mg N/ℓ). 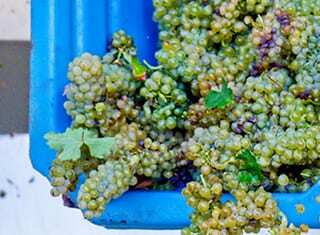 This is not surprising, as Chardonnay has previously been reported to be a “high YAN-yielding cultivar” by other surveys done in other wine regions of the world. Interestingly, Chenin blanc, the most widely planted varietal in South Africa and a well-represented cultivar within the survey – with 175 samples collected over two vintages (2016: 108 samples, 2017: 67 samples) – had an average YAN of approximately 178 mg N/ℓ in both vintages. On the other hand, all the red cultivars surveyed, except for Pinotage, had an average YAN of less than 200 mg N/ℓ. Cabernet franc and Merlot had the lowest average YAN of 108 mg N/ℓ (13 samples) and 110 mg N/ℓ (30 samples) – well below the recommended level of 140 mg N/ℓ. All the districts that were represented in both vintages had lower average YAN concentrations in 2017 compared to 2016. This is again because of the inclusion of red cultivars in 2017. When looking only at white cultivars, some districts had higher average YAN concentrations in 2017 compared to 2016 and others lower. Paarl and Walker Bay were the only districts to have consecutive averages above 200 mg N/ℓ. 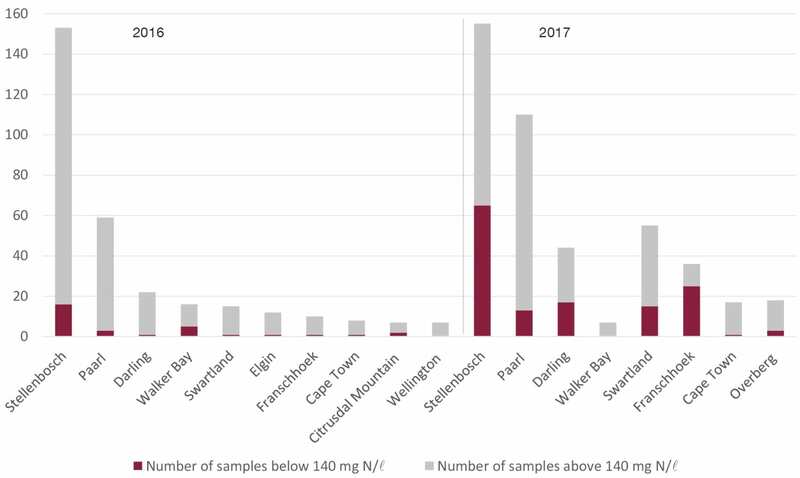 However, in 2017 the range of concentrations found in each district was rather large, with the Swartland having a range (max-min) of 439 mg N/ℓ (40 samples) and many other districts having a range well over 300 mg N/ℓ. YAN cannot be predicted solely on cultivar or region. There are various other factors, such as climate, rootstock, soil type, and various viticultural practices, such as soil and canopy management, that play a role in the YAN concentration of the resulting must. As such, YAN concentration is not the result of any of these factors in isolation, but rather as a result of the interaction of all these factors – genetic, environmental, and viticultural. Due to the complex origin of YAN, it is advised that when at all possible, to measure this important parameter before the start of fermentation (1). It is known that winemakers sometimes make nitrogen additions without previous knowledge of the nitrogen status of their musts. The danger of these prophylactic nitrogen additions is highlighted by the diverse roles that YAN plays during fermentation. As previously mentioned, YAN plays an important role in preventing stuck or sluggish fermentations by serving as a source of nutrients which allows the production of sufficient yeast populations, capable of fermenting a must to dryness (2). 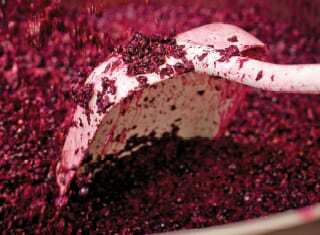 However, YAN also plays a major role in the formation of various aroma compounds in the resulting wine. Musts containing low concentrations of YAN have been associated with the increase of unwanted compounds, such as hydrogen sulphide and fusel alcohols, which are associated with the production of off-flavours and aromas (3). Furthermore, low YAN has been found to directly lead to the decrease of desirable fruity aromas due to the decrease of ester formation during fermentation (4). It is important to note that YAN concentrations that are too high also bear consequences during winemaking. Very high YAN has been associated with microbial instability by providing nutrients for the potential growth of spoilage organisms, the production of certain unwanted allergens and carcinogens, such as biogenic amines and ethyl carbamate. Furthermore, very high YAN may also contribute to the formation of unstable proteins leading to haze production (5). The type of nitrogen addition – DAP or complex nutrients – also plays a vital role in the success of your fermentation as not all sources of YAN are used in the same way by the yeast (6). This will, however, be discussed in Part 2, where the roles of ammonia and FAN, the components of YAN, are further investigated. This is part 1 of a two-part series in which we investigate the Yeast Assimilable Nitrogen (YAN) status of grape musts sampled over various districts within the Western Cape. 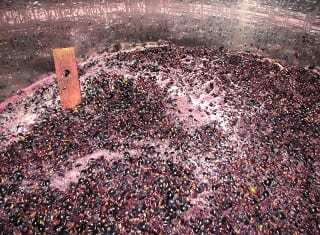 Part 1 reports on the results of the YAN survey conducted during the 2016 and 2017 harvests, whereas part 2 will aim to provide winemakers with some guidelines regarding nutrient supplementation when faced with a certain concentration and composition of YAN. Bell, S.J. & Henschke, P.A., 2005. Implications of nitrogen nutrition for grapes, fermentation and wine. Australian Journal of Grape and Wine Research 11(3), 242 – 295. Bisson, L., 1999. Stuck and sluggish fermentations. American Journal of Enology and Viticulture 50, 107. Vilanova, M., Ugliano, M., Varela, C., Siebert, T., Pretorius, I.S. & Henschke, P.A., 2007. Assimilable nitrogen utilisation and productions of volatile and non-volatile compounds in chemically defined medium by Saccharomyces cerevisiae wine yeasts. Applied Microbiology and Biotechnology 77(1), 145 – 157. Ugliano, M., Henschke, P.A., Herderich, M.J. & Pretorius, I.S., 2007. Nitrogen management is critical for wine flavour and style. Australian and New Zealand Wine Industry Journal 22(6), 24 – 30. Mendes-Ferreira, A., 2015. The impact of nitrogen on yeast fermentation and wine quality. Cooper, T.G., 1982. The molecular biology of the yeast Saccharomyces. In: Metabolism and Gene Expression, Strathern, J.N., J.E. & B.J. (Ed.). Cold Spring Harbor Laboratory Press.